King Star King finally premiered online in it's entirety last night, one of the first Titmouse projects to not make it to broadcast television for reasons as of yet unknown. After years of checking out what Adult Swim's had to offer, I have to admit I'm a little baffled that they opted for this curious online only approach. For anyone that's watched Adult Swim for long enough, it kind of begs the question as to whether the content was an issue. 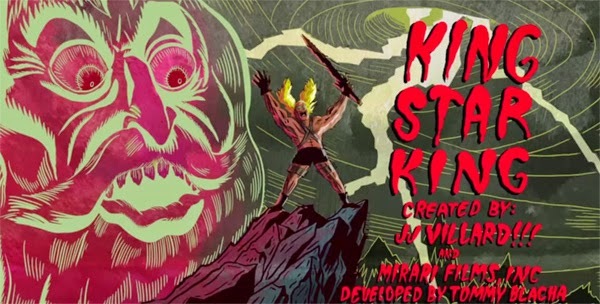 Developed by J.J. Villar, a former Dreamworks artist, King Star King follows the exploits of a He-man like warrior and his intergalactic exploits (And his job at a waffle restaurant). The series' outlandish, psychedelic style reminded me of the absolutely incredible SuperJail, also created by the mad geniuses at Titmouse. As of now the entire first season of King Star King is available to watch online on Adult Swim, with the series finale only being viewable if you manage to complete ten levels of Floppy King, the videogame tie in available on the website as well. Have to commend them for the novel approach, it's rare to see companies tie a full episode behind a challenge like that.